When will light shine upon this unsettling ocean? And in every moment, in the dim of night, our hopes and dreams are vanished. November is a somber month in the Iranian calendar. In this month, five years ago, Tehran was shaken by the murder of five innocent people, five intellectuals and nationalist figures, what came to be known as the serial murders of the fall of 1998. The stabbing to death of Parvaneh and Dariush in the confines of their home, and the disappearance of Mokhtari, Poyanedh and Sharif and their tragic death marked the beginning of a battle between the forces of ignorance and brutality and the defenders of justice. Abdol-Karim Lahiji has been on the forefront of this crusade, to find answers to the reasons behind the murders and defending the families of the victims. Lahiji, a long-time advocate for human rights and a lawyer who has been in the practice for 38 years, has dedicated his life in the defense of innocent victims of violence and those whose rights have been abused by the Islamic Regime. Dr. Lahiji, who is on a tour in the US spoke after a gathering at Georgetown University. He is here to promote the award to his colleague and friend, Shirin Ebadi who will be given this honor on December 10, 2003 in Norway by the Nobel Peace Prize Committee. 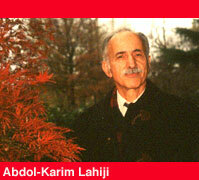 Mr. Lahiji was in Paris alongside Shirin Ebadi when the news of her nomination was pronounced. He was jubilant like so many other Iranians, not only because one of her compatriots has been chosen but also a woman of such stature was nominated. We spoke about the past, the present and the future of human rights in Iran. His observations follow. I established the Society in Defense of Human Rights in Iran in 1983 in France. I have been the vice president of the International Federation of the league of Human Rights for the last six years, which consists of 120 countries throughout the world. It includes CCR, which just submitted a petition to the United States Congress in regards to the treatment of prisoners in Guantanamo Bay. My area of interest and responsibility has been Iran and the Middle East. I am also the President of the league of human rights in Iran. For the last decade, we have tried to protect political prisoners in Iran and their defenders. By informing the public about their plight and mentioning their name in the media and by obtaining awards for them, in a way we have tired to shield them from being harmed. When their names are mentioned in the public, the Islamic Republic is less likely to harm them or physically eliminate them. In previous years, I have tried my best to obtain such awards for Abbas Amir Entezam . We were able to get him the Kreisky award; Bruno Kreisky was the former Austrian Chancellor who fought against the Nazis. By doing so, he was temporarily released from jail. For Shirin Ebadi, we obtained the 2001 Human Rights Watch Award and for Mehrangiz Kar, the Rafto Award from Norway. Ms. Ebadi's name was also mentioned for other prizes this year. Among them, the Martin Ennals Award; he was the President of Amnesty International and the same person who went to Iran in the 1970's and met with the Shah. Because of these meetings and a sort of gentlemen agreement, the former regime allowed the Red Cross to visit the Iranian prisons. This year, we were trying to get France's highest award for human rights for Ebadi when I heard of the possibility of her candidacy for the Nobel prize. Personally I knew that she was among the candidates but frankly I doubted that among the 100 names, which included such rivals as the Pope and Havel, she would have a chance. Later when I found out that among the five judges, three of them were women, I knew that the chances might be higher. By coincidence, Ebadi was in Paris at the time on the invitation of the municipality of the city of Paris and Le Monde Diplomatique for a forum on culture and film in Iran. She was supposed to return to Iran on Oct 7th. I asked her to stay a bit longer and she agreed. She was due to return on October 10th in the afternoon. When at 10 o'clock in the morning, they contacted us and told us of the judges ruling, at First she thought it was a joke, but when at 11 in the morning the radio announced the news, we knew that this was no joke. That's when I remembered this famous saying of the late Mehdi Bazargan regarding the Iranian revolution. He said, for years we were waiting for rain but got a storm instead. And Ebadi's nomination was indeed like a thunderous storm that took all of us by surprise. And I must tell you that we had the largest Press conference in the 80-year history of the Federation. There were more than 300 reporters who were fighting with one another to get a chance to talk to her. I had to finally calm them down by saying this is a prize for Peace not War! Our personal and professional friendship thus started from 1963. I have known Ebadi since she entered the Ministry of Justice as a young woman jurist. This was indeed an important event for a woman to rise to such a level; especially in an institution that was notoriously male-dominated. We had lunch every two weeks; there were six of us. I was the only man among the five women lawyers and judges. Ebadi was aware of my human rights activities and she was wary of it. She used to criticize me for it and tell me that I should abandon such activities, as they can be dangerous. She used to tell me that I should continue with legal work and teach at the university. But the revolution changed everything. What happened to women and their status as citizens was in fact a turning point in the politicization of Ebadi and many others. When women were forced to wear the hejab and they were stripped of many of their legal rights, Ebadi got the shock of her life. And then of course, she was also stripped of her position as a judge, solely on the grounds that she was a woman, as if it were a crime! These women were waiting to be sworn in as judges and all their hard work and years of studies vanished with one single decision. In fact, I wrote a letter to Justice Minister, Dr. Mobasheri, requesting an immediate reply, but Khomeini had ordered against any action in this regard. He was angry with my objection and began to slander the forty or so lawyers who had protested this illegal action. My first objection had been to the summary executions taking place. Unfortunately, at this time the atmosphere of increasing repression prevailed and to my dismay, I had to leave the country. Ebadi remained behind and became involved in social work and doing what she could under the most strenuous circumstances. She became acquainted with the rights of ordinary people and began to write a series of articles and books. Ebadi is the author of 11 books, some of which have been taught at the law school and various universities. Among her work, one should note the book about children's rights, which is a valuable piece of work that has been translated by UNICEF into English. The second work is that of a series of documents comparing the UN Declaration of Human Rights with those in the Islamic Republic. The third book, which is under print, is on the rights of women in Iran. Ebadi's contribution to the laws regarding women and children in Iran consequently changed her from a lawyer to a human rights activist. She has constantly challenged the Islamic regime without revolutionary means but by utilizing exisitng laws. With her non-violent struggle, she has challenged the essence of the laws created in Iran by the Islamic authorities. This type of defiance is one that is legal, social and not necessarily political but all within the context of law. She has been a pioneer in introducing men and women of Iran to their most basic and human rights as citizens. What distinguishes her from other is that she is not an intellectual who merely talks. She is a woman of action. She proposes new laws, changes the existing laws. Her contributions have changed many of the current laws, which directly affect women and children. Because of her courage and bravery, the Mnsitry of Intelligence repeatedly threatened her. Even she has been questioned about her affiliation with me and quite openly she has told them that we are old friends. In fact, I know and have seen with my own eyes that she was on the list of death put out by this infamous ministry. She was to be murdered right after Pouyandeh. But, Dorri Najaf-Abadi told the killers to wait until after Ramadan so that she would be finished with her fasting! These are the circumstances Ebadi and many others have lived and worked under. And if it weren't for the ongoing work outside of Iran, Ebadi's name would have been added to the list of those who died. Or her incarceration would have lasted longer like her friend and collegue Nasser Zarafshan who is still in jail. Or like her other friend, Mehrangiz Kar, who was forced to leave the country. But she has remained in Iran in order to ameliorate the human rights situation.Five years have now passed since what was referred to as the serial murders, or what I refer to as the political murders of the fall of 1998. The families of the victims have all boycotted the ludicrous trial since none of the very elementary legal regulations took place. The people who ordered these killings are still at large; like Fallahian and Dori Najaf-Abadi. In the realm of its own Islamic laws, the so-called Islamic orders cannot be implemented without the orders from higher above. Even the killers themselves have acknowledged that they were just taking orders. They wanted to have the trial behind closed doors or in a military tribunal, something that is absurd since these killers did not act as military personnel. They were civilians. Therefore, after consulting with their lawyers, the families declined to participate in this mockery of a trial. It is like a blow to them in every respect. Not only has the life of their loved ones been brutally taken away, but to make it worse, the families are humiliated by the regime's staging of farcical trials. To top it, both Shirian Ebadi and Nasser Zarafshan who were the lawyers for the families, were put behind bars. This type of action is against all the norms of international law and even the laws in the Islamic Republic. The families have sent a petition to the UN high commission for human rights and objected to the unfair and illegal trials. Thus far, after 5 years, the political murders's case remains unsolved. And unfortunately, we see a similar file is now open, that of journalist Zahra Kazemi who was so viciously murdered in Evin Prison. That is what we are facing, a criminal code of justice by a bunch of criminal perpetuators. Now, as their lawyer abroad, I am faced with another criminal case. I represent Zahra Kazemi's son, Stephan. Ebadi is doing her share of work for Kazemi's mother in Iran. But at the time that the families of Forouhar, Mokhtari, Pouyandeh and Sharif are commemorating their death, we are helplessly trying to defend a new victim. One other note on this subject, Parastou who left for Iran two weeks ago, was told by the authorities that her parents' home might be confiscated as it has become the den of anti-government activities. She also had to confront them in regards to where the ceremonies would be held. Fortunately it was held in Hosseiniyeh Ershad in Tehran instead of Behesht Zahra, which is outside the capital. Five months into the horrific murder of Zahra Kazemi., we are faced with yet very similar hurdles created by the Islamic officials, very much like in the serial murder cases. Recently I had a long meeting in Montreal with the representative of the Canadian government and some human rights organizations. A resolution will be introduced to the United Nations by the Canadian government requesting answers from the Islamic regime [News here]. This as I have said repeatedly is not a just a legal dossier but a political one. What we have to realize, and I have told the Canadians, is that we cannot expect miracles from the Ministry of Justice of the Islamic Republic. They are themselves the tools of oppression and not one that seeks justice. The Tehran Prosecutor General, Saeed Mortazavi, a replacement of Assadollah Lajevardi (the butcher of Evin who was gunned down by MKO) is a criminal himself. They have in a way ridiculed the whole dossier by insinuating that those who killed Zahra Kazemi acted alone, and that her murder was an accident. The UN resolution calls for Mortazavi's immediate resignation and the appointment of a new impartial prosecutor. The Islamic regime must be held accountable for this case, as those involved in this crime were not acting alone. The motivations behind these murders are very clear. Dariush and Parvaneh Forouahr were well known among the Iranian society. They had been involved in political struggles long before the 1953 coup. And Mokhtari and Pouyandeh were both among the directors of the Association of Iranian Writers. They were what we called Degar Andish; their viewpoints were different from the establishment. Therefore, for the ruling clerics who have never accepted anything but their own way of life, they were a threat, an obstacle. So they had to be eliminated and of course we know they were not the first ones. Previously there were Mir Alai, Tafazoli, Ghafar Hosseini in Iran and Bakhtiar, Ghassemlou and others abroad. They were on the death list of the Islamic regime. The death list included some 80 individuals, if not more. The Islamic Republic's intelligence apparatus, before Khatami's eletion and after, has always been linked to the murder of its opponents. We must never forget these crimes: these cruel and violent acts against Iranian citizens. The Iranian people must remember them at every instance, in every moment since those who were killed spoke out knowing that their lives may be in danger. We should never forget these terrible events in our history. However, when it comes to retribution, it is up to the Iranian people how they wish to deal with the murderers. Whether there should be amnesty or not. It is not my decision or yours or even the lawyers of the victims. As a nation, we must come together and find the best way to come to terms with this issue. Nevertheless, if we want to forgive that is one option. But we should never ever forget. We should keep the victims' memories alive. And I think Iranians are tired of revenge. We have seen enough killings for a lifetime. In my opinion, vengeance is no longer an option. Only tolerance. What prompted me to become interested and involved in human rights activities was in the early years of 1960's . When I was in law school, I was active in political struggles. I was the student representative in the National Front. But honestly I was not attracted to any party or organization. I did not have ambitions to become a political leader of any sort. From the age of 12 I knew that I wanted to become a lawyer. In 1968, the United Nations had its 20th anniversary of the formation of Human Rights Charter in Tehran. It was referred to as the Tehran Conference. Ashraf Pahlavi, the Shah's sister, headed the Iranian human rights commission. And for obvious reasons, I was barred to attend. At that time, Renee Cassin, the French lawyer who was also the recipient of the Nobel Peace Prize had come to Iran and I was quite impressed by him. It coincided with the trial of some political prisoners -- the Jazani group (executed by the Shah's regime) I knew them from the time of my political activities from the university era. Due to the courageous efforts of Mihan Jazani (Bijan Jazani's wife) a letter was presented to the committee asking for an intervention in the matter. It was some time later that I became seriously involved in human rights activities and decided to take this road. Obviously, at the time, my involvement was not public. In 1976, we formed two organizations in Iran and started our work openly, especially in the area of defending political prisoners. Unfortunately, our activities seized when in March of 1982 I had to leave Iran as my life was in danger. What is needed is that we have to introduce the culture of human rights into our sphere of life, not just in the area of politics but within our homes, in our daily relationships, with our families and friends. It should become a way of life and existence. For the young generation of Iranians who have grown up here, this mentality is understood. They know and have lived with the culture of human rights. What we have to do as human rights activists is to bring awareness to those Iranians who come from Iran and those who are residing there. This culture should be established within the realm of our society, a terminology that has been foreign to us, never been embedded in our vocabulary or exercised in our daily life. Essentially, this is what the young generation of Iranians could take on: to understand and apply the idea of human rights. Additionally, we have to work much harder in getting the support of world public opinion and to become more sensitive towards human rights violations in Iran. Now with the Nobel Peace prize, we have a greater chance. An ongoing campaign must undergo to free all the political prisoners in Iran, and for the world community to be more responsible towards the issue of democracy and human rights in Iran. The new generation can and must create this sensitivity and bring about solidarity among Iranians from all corners of the world.